elephant tusks « What Happened to the Portcullis? Reserach by the University of Washington reveals a dramatic decline in elephant populations in the 1980s prompted the international community to ban ivory trading at the end of the decade. But more than a few loopholes remained, including the ability to import ivory to the US as hunting trophies, or if it was sourced from an animal that died of natural causes. But perhaps the most easily exploited was that which allowed the sale of ivory acquired before 1976, which inspired traders to pass off their goods as antiques for profit. Scientists have now used a form of carbon dating to determine the real age of ivory samples, with an early study revealing more than 90 percent of seized shipments came from animals that died within three years prior. Humans tested a whole lot of nuclear bombs in the 1950s and 1960s. One of the upshots of this was the doubling of radioactive isotope carbon-14 in the atmosphere, which is in turn absorbed by plants. Because animals (and humans) eat plants, the isotope is passed onto our tissues, and because the concentration of carbon-14 is always declining, scientists can use the isotopic signatures of things like bones or tusks to gauge the age of the material. This phenomenon, known as a “bomb carbon” signature, has been used to to estimate the age of human remains, trace cocaine trails through the Americas and identify fake whiskey, and now scientists have applied it to a stockpile of illegal ivory shipments seized between 2002 and 2014. Samuel Wasser of the University of Washington, together with scientists from the University of Utah, studied a total of 231 ivory samples to find only a single tusk from an elephant that had died more than six years before landing in the hands of authorities. More than 90 percent of the elephants from whom the ivory came had died less than three years prior. 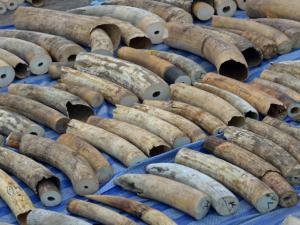 All of which suggests that not a whole lot of old ivory is being shipped out of Africa. “This work provides for the first time actionable intelligence on how long it’s taking illegal ivory to reach the marketplace,” says Lesley Chesson, study’s co-author. “The answer: Not long at all, which suggests there are very well developed and large networks for moving ivory across Africa and out of the continent.” The research was published in the Proceedings of the National Academy of Sciences. Singapore on Monday crushed and burnt almost eight tonnes of ivory confiscated over two years to try to deter smugglers as activists called for tighter enforcement. Over 2,700 elephant tusks weighing 7.9 tonnes were fed into an industrial rock crusher before incineration. It was the fist time seized ivory had been destroyed in Singapore, the Agri-Food and Veterinary Authority said in a statement. Previous hauls were returned to the originating country, donated to museums or kept for education. The tusks, estimated to be worth Sg$13 million ($9.6 million), were seized on four separate occasions between January 2014 and December 2015. In May 2015 some 2,000 tusks were found hidden in a shipment of tea leaves from Kenya. “The public destruction of ivory sends a strong message that Singapore condemns illegal wildlife trade. By crushing the ivory, we ensure it does not re-enter the ivory market,” said Desmond Lee, a senior minister of state in the interior and national development ministry. Singapore can do more to enforce strict anti-trafficking laws, said WWF-Singapore communications director Kim Stengert. “There are illegal wildlife shipments caught in other ports after they came through Singapore. So we definitely need to step up efforts to enforce the strict rules,” he said. Chinese authorities destroyed more than half a tonne of confiscated ivory in Beijing here the other day. The public event, organised by the Chinese State Forestry Administration and the Customs Department, is set to display the country’s determination to ‘further protect wild animals’, according to the People’s Daily Online. A whopping 662kg (1,460lb) of illegal ivory and ivory products were ground into powder as part of the central government’s crackdown on the illegal trade. The destroyed ivory items include thousands of ornaments, jewellery and fine art pieces. Whole elephant tusks were carved into the images of Buddhas, goddesses or Chinese landscapes. Members of the media and diplomats were invited to attend the public destruction, which took place at Beijing Wild Animals Rescue Centre, as Chinese authorities hope to rid the country’s reputation of a global trading hub for illegal elephant tusks. The Royal Malaysian Customs has received congratulatory messages from South Africa and the World Customs Organisation after thwarting one of the biggest ivory smuggling operations in recent memory. On Monday, Selangor Customs had seized 24 tonnes of elephant tusks and ivory worth US$20 million (RM60 million) in Port Klang from a China-bound ship that is believed to have sailed from Togo. It is estimated that 750 elephants were killed to produce the quantum of tusks and ivory that was seized. To date, this is the biggest seizure of its kind in Malaysia. 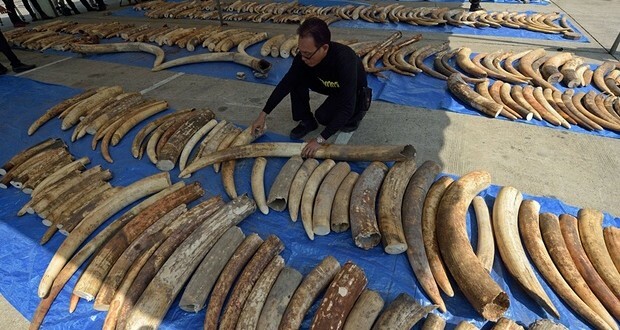 Confirming the seizure, Selangor Customs corporate communications chief Mohd Zhafri Johari explained: “In the China market, ivory could fetch a price of approximately US$25,000 per kilogramme”. Those arrested will be charged in court under Section 133(1)(a) of the Customs Act 1967 for false declaration and under the Convention for International Trade in Endangered Species of Wild Fauna and Flora. This international treaty was drawn up in 1973 to protect wildlife against over-exploitation and to prevent international profiteering which involved threatening of species.